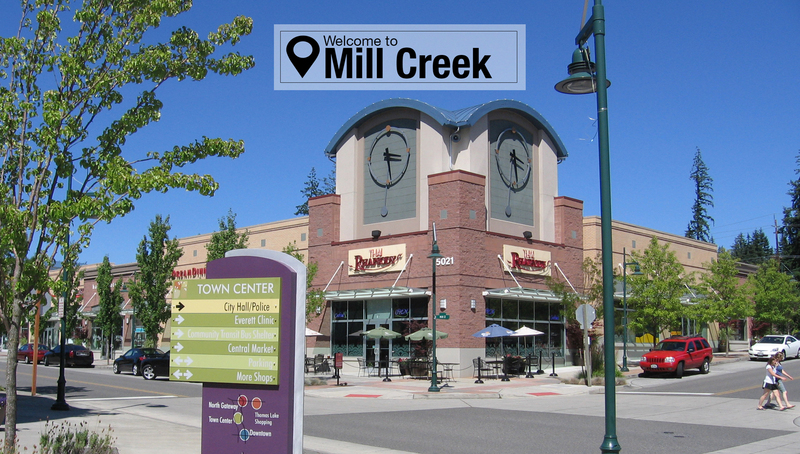 Located right outside of Bothell, Mill Creek is an ideal suburban city. Mill Creek was originally a small community built around a golf course, but within the last 40 years it has blossomed into a thriving suburb through carefully controlled city planning. Mill Creek is a residential community that includes its own police force, community pool and parks, and a new, community-oriented Town Center. Mill Creek is in close driving distance to company campuses such as Microsoft, Amazon, Boeing, Google, and the biotech in Bothell. Mill Creek is in close proximity to the UW Bothell campus as well. The Mill Creek Town Center is the exciting new go-to place in the city. The Town Center, according to the city website, “has created a vibrant gathering place for the community with plazas just right for relaxing and enjoying some quality time while watching pedestrians stroll past, on the wide sidewalks that line Main Street.” There are many retail stores and tasty restaurants to choose from at the Town Center.